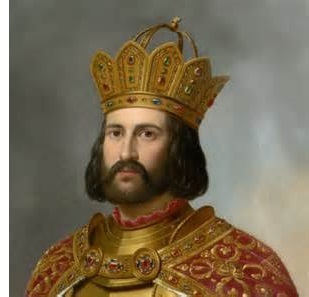 Otto I the Great (912-973) - Duke of Saxony who is usually considered the founding ruler of the Holy Roman Empire (although since Charlemagne was crowned emperor by the Pope, some consider him the first Holy Roman Emperor). His father, Henry I the Fowler was one of the first monarchs who envisioned a unified German nation, and upon inheriting the duchy in 936, Otto pursued his father's dream. As a result, the modern state of Germany is said to have its roots in his reign. To achieve this dream, he had to become the most powerful ruler among the aristocracy. So he elevated his position by appointing family members to subordinate duchies thereby bringing their subjects under his ultimate authority. Those kingdoms which he could not bring under his control, he conquered. Historically, Saxony and Bavaria were the two most powerful German states, and so it was in Otto's time that Eberhard of Bavaria refused to submit. Allied with another Eberhard (of Franconia) and Otto's half-brother, Thankmar, they presented a formidable barrier to Otto's plans. But Otto ended this opposition by 939. Thankmar was besieged at Castle Eresburg, and eventually assassinated at the altar of the church of St. Peter. Eberhard of Franconia was defeated at the Battle of Andernach; and Eberhard of Bavaria was deposed and banished. Otto also had a younger brother, Henry, who had designs on becoming king himself; but by 941 his support was crushed and he was isolated. Instead of punishing his brother though, the two reconciled and Otto made Henry Duke of Lorraine. With his political position secure, Otto went to work on the clergy. He personally made all ecclesiastical appointments in his realm, and would only appoint priests who had taken a vow of celibacy. That way, they could not establish dynasties by passing their authority onto an heir. By doing this, he was able to break the power of the Catholic Church within his kingdom and bring the clergy under his control. But this only made him the most powerful man in Germany (as it existed then). It was his external conquests which allowed him to expand his power beyond his borders and eventually become emperor. In 955, he defeated the Magyars who had been invading Western Europe. This elevated his stature as a champion of Christendom as the Magyars were pagan. And in 951 he conquered Italy (although without much of a fight), bringing him right to the Pope's doorstep. While not a true unified state, he was able to establish hegemony over most of Central Europe and was crowned emperor of the Holy Roman Empire by Pope John XII in 962.